Google unveiled a new search experience called Google Instant which displays results as the user types, providing suggested search phrases and updating the results as the string progresses. Google claims this enhancement will radically improve the speed of search — saving two to five seconds per search — while maintaining the relevancy of the results returned. 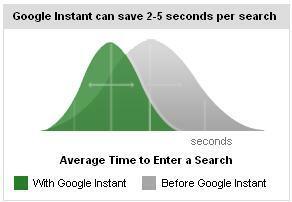 The key user benefit from Google Instant is the time saved for the user. Based on its independent calculations, Google estimates that it will save search users 11 hours with every passing second by making the search process faster by a 2 to 5 seconds per search. •	Dynamic results:Google dynamically displays relevant search results as the user types for quick interaction and click through to the Web content needed. •	Predictions:One of the key technologies in Google Instant is that Google predicts the rest of your query (in light gray text) before the user finishes typing. The User can now stop typing, look down and find what he was looking for. •	Scroll to search:The user can Scroll through predictions, and see the results instantly for each as they arrow down. The Google blog terms this Search as you type where people can get results as they type their queries. Imagining the future of search, the idea of being able to search for partial queries or provide some interactive feedback while searching has come up more than a few times. Google Instant is currently available only for searchers in the United States. Additionally, it only functions on searches from the Google home page or from the search box at the top of a Google search results page. It doesn’t work from the Google toolbar or from the search box at the top of Gmail for mobile searches and that’s coming soon or if the servers detect that the user has a slow Internet connection. There’s a small link to the right of the search box on a search results page that allows the user to toggle Instant “on” and “off.” Users can also change the settings on your Google search preferences page at http://www.google.com/preferences. 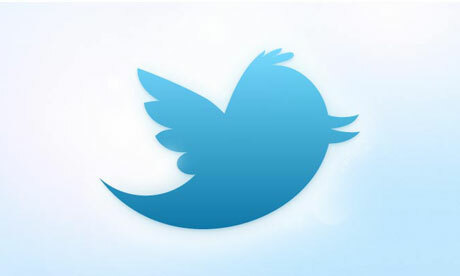 It will speed up searches, if and when users become comfortable with it. I am quite used to clicking on predicted search terms halfway through my querries. Is this the SEO killer? But it’s how Google Instant might affect businesspeople who market online — those who rely on high search engine rankings, or pay-per-click programs such as Google Adwords — that is causing the most concern. Put simply, if Google changes the way people search, in a way that favors one search term over another, then there’s a huge group of people who might need to rethink the way of conducting search engine marketing and search engine optimization campaigns. The terms Google suggests will become more important because more traffic will come through clicks on those terms. Searchers might not enter the full phrase they had in mind; instead they’ll be more likely to stop and click on a term that Google displays. So ranking for the phrase that Google suggests will become more important. It also might mean higher costs for Google AdWords bids — and more revenue for Google — since there will be more competition for these demonstrably more-trafficked terms. Also, when using the Google Instant, the box with the suggested search terms on it takes up space on the page. This means search results are shifted down the page; so that fewer of them are visible on screen without scrolling. Mobile screens may get complicated because of this. Google’s sponsored links, the ads, are typically shown above the organic search results. This means the user gets to see more ads and less natural search engine results on the page, especially on small computer screen. This increases the likeliness of a click being made on the ad, simply because more links on the page are for ads. More clicks on ads mean, again, more revenue for Google. It also means getting to the very top of the natural search engine results will be more important than ever, since the only organic results someone might see will be the top couple of listings. The full impact of Google Instant won’t be understood for months, until people — and advertisers — adapt to this new search behavior and decide if they like it. But for business owners who markets online, it becomes more important than ever to monitor their website’s performance and search ranking. Zynga is to Social gaming what Google and Facebook are to Search and Social networking. In partnership with Facebook, Zynga has metamorphosed into the largest internet social gaming platform. Facebook and Zynga have a symbiotic relationship. While Facebook provides Zynga the scale in terms of its 500 million account holders, Zynga provides the stickiness to Facebook usage. Together, Facebook and Zynga are now instrumental in staging out the first global virtual currency, the Facebook Credits. Zynga, based in San Francisco, is the largest maker of games on Facebook, and is expected to record revenue of as much as $500 million this year, according to Inside Network. Zynga has more than 200 million monthly active users, with between 1 percent and 3 percent paying for virtual items. In a Tech Crunch event, Disrupt, Internet Evangelist and Investor, Bing Gordon, who founded gaming giant Electronic Arts prior to joining KPCB, recalled what made him think that Zynga would be a massive success. Gordon said that, years ago, he anticipated that there would be four disruptive trends in the game industry: social, analytics, an “APIable Internet” (app economy), and new payment methods. But he’d previously thought of each of these as separate entities, not something that would be combined into a single company. Then he saw what Mark Pincus was onto with Zynga — which he says combined these “four disruptions in one”. Mark Pincus, CEO Zynga, in the same event, stated that Zynga is still far from being an Internet treasure, at least in the way he defines one. The way he defines an internet treasure is about adding a new meaning to the “daily grind” of the lives of the users. I suspect if that be the statement, Pincus has more on his mind then just the farming games to “add a new meaning to the daily grind of the lives of the users”. 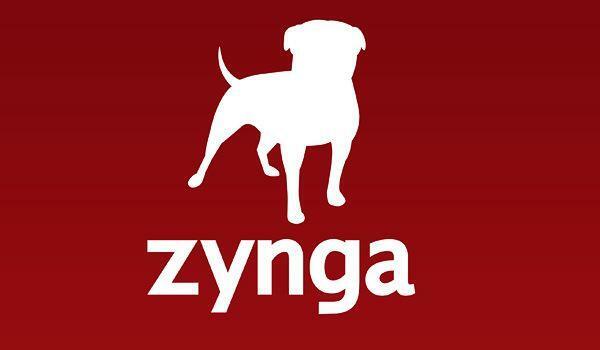 As of Today, Zynga is a part of a new concept that is starting to take wings: Virtal Goods. The U.S. virtual-goods market may grow more than 30 percent in 2011 as games on consoles and mobile devices replicate the success of applications on Facebook Inc. The market will jump to $2.1 billion next year from $1.6 billion in 2010 and $1.1 billion in 2009, as quoted by Inside Network. Companies such as Nintendo and Ngcomo are following suit after Zynga added the new dimension to virtual goods on social games. The objective is to get more and more engaged users into paying for virtual goods. Social Gaming now accounts 40% of the virtual goods market with Zynga, Electronic Arts and Walt Disney Co making up half of the social gaming market for next year. Online gaming in India is rapidly expanding. Forty one percent of active Internet users played online games in 2008, up 89 percent from the previous year, according to the Internet & Mobile Association of India. With more than 81 million Internet users, India is projected to become the third largest online market behind China and the U.S. by 2013. About an year or more back,I had written about a billion Indians connected through Telecom networks. That was a report by Gartner then.A recent report by iSuppli supports the year old theory of a billion subscriptions. 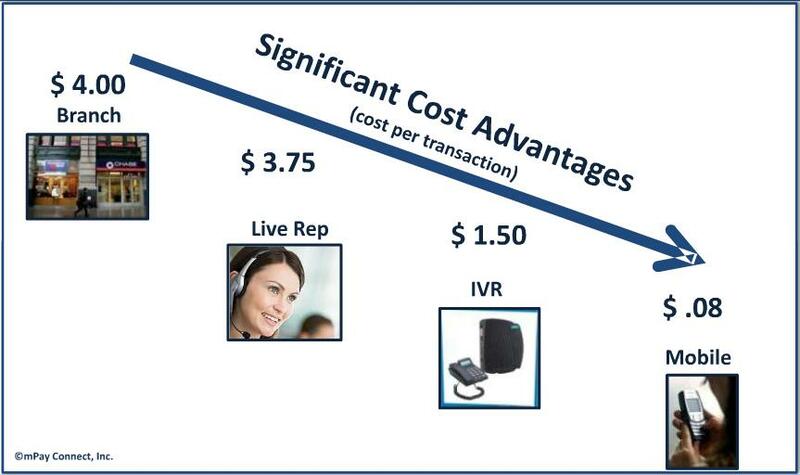 Wireless subscriptions in 2014 expected to amount to more than 97% of the country’s population of 1.26 billion. Taking it further from the 652 million connections, the next 350 million mobile connections will really be scrubbing the bottom floor of the pyramid. •	Dual SIM contributed to 23% of overall GSM handset sales in May. 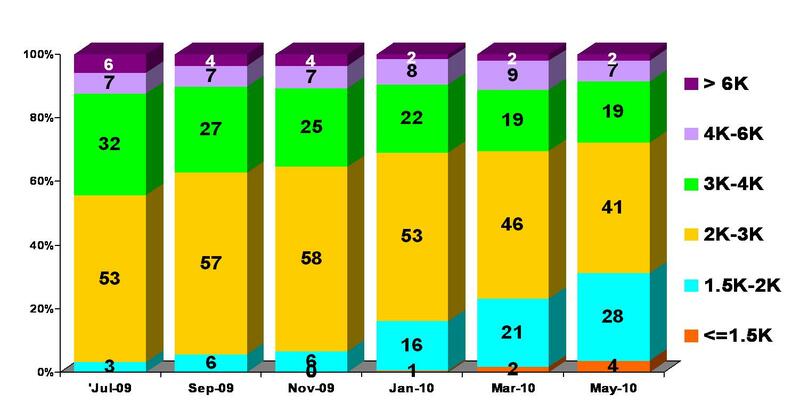 •	Dual SIM Market grown by 45% in 1St half of 2010. •	2K – 3K price band Dual SIM contributes to 41% of overall dual SIM sales. •	Dual SIM market primary driven by Indian brands or Chinese brands. Dual SIM Market sizes as a %age of the Total Market in terms of Price Categories. As discussed in an earlier post, the next 350 million will be a justifiably difficult segment in terms of viabilities versus realizations. With Call and Data rates scrapping the bottom, connectivity to rural millions will also not come at high ARPUs. In fact, that ARPU for the next 350 million will be about $1 or less. Thus the ability to collaborate and cut costs will be critical differentiators for Telcos. Towards this, Telcos would need to be open to new distribution and marketing paradigms based on collaborating with 3rd parties. Government of India under its rural empowerment program is piloting many such initiatives which offer the last mile connectivity. Similar arrangements of distribution such as Fertilizer companies or e-Choupal constructs will be important and critical for Telcos to incorporate and collaborate in terms of businesses needs. As discussed about in an earlier blog, when increasing majorities of our lives are going online, and online behavior and habits will increasingly get transactional such as buying goods and products. Due to the global nature of the domain itself, purchasing and buying will be greatly facilitated by a virtual online currency, for procuring virtual goods and services online. Sales of virtual goods are projected to reach $1.6 billion this year in the United States alone, according to an Inside Network report. About half of that will be spent on social games, and the majority of that in Facebook games such as Farmville. 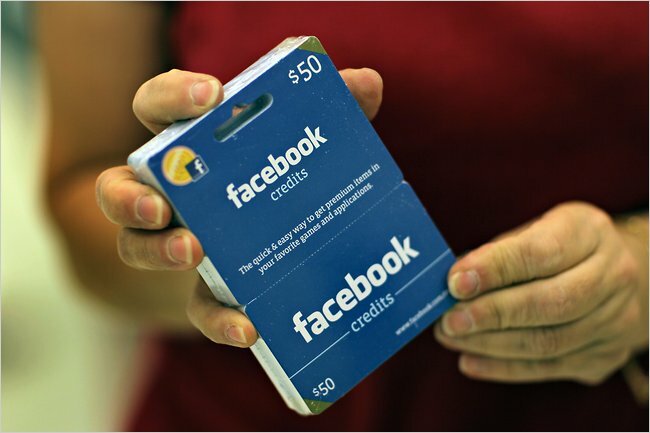 Facebook Credits is one of the first virtual online currencies that promises to be a billion dollar business soon in the days to come. Facebook already has a big advantage over those companies: a virtual currency, Facebook Credits, that works across different apps rather than being tied to one specific app or another. The other fact that also provides the edge to Facebook in terms of virtual currency is the way they have migrated their partner game and application publishers: Zynga, Playdom, Playfish, Crowdstar, RockYou to Facebook credits. Zynga, the Farmville creator has already been selling over $1 million-worth of virtual credits per day as early as April. Because of the relationship that Facebook has with publishers, it has been able to have every single major publisher switch to Facebook Credits. This provides enormous traction to the platform in its very early days. The significant other players who could challenge Facebook on the virtual currency platform are Apple and Google. Apple with its 250K apps and iTunes store already has a platform ready through which it needs to integrate its virtual currency. Apple also has the experience and the competency in terms of real time selling of their virtual goods i.e selling iTunes through payment gateways and pre-paid gift cards. Google hasn’t reported much on the virtual currency but with allies like Google Checkout, YouTube, Google Books; Google also has a very strong base for building a virtual currency framework which would integrate into its online merchandise pretty well. Emergence of more than 2 virtual currency platforms can create complications for developers. App users and gamers will then have to maintain stockpiles of multiple virtual currencies, one for each platform on which they wish to access the same cloud-based app or game which could be a bit of muddle. However, ignoring/non-participation this platform could be a foolish tactic because as and when the Virtual currency platforms reach critical mass and thresholds, would mean lost opportunities and failing to encash on the opportunity ! 1. Large “Enterprise” Apps: The SAP and Oracle ERP systems run on broadband and even then are notoriously heavy on system resources and usage. 3G with its enhanced data bandwidth and higher speeds of data would be a huge enabler in terms of running these large “enterprise” applications on the mobile “on the go”. 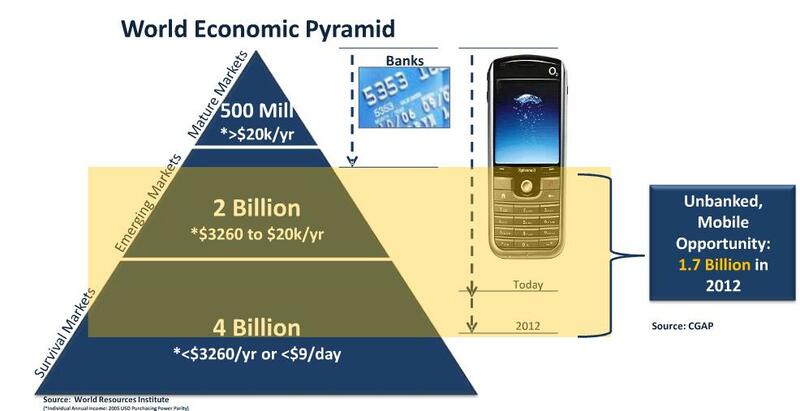 Enterprise adoption for running business and systems would thus be the biggest contributor for 3G revenues. 4. Cloud Streaming: Music, Video Clippings, or Streaming Games are possibly the first phase of Cloud based services. Going beyond, the focus would shift to the Cloud wholly. The kind of stuff being spoken of here is Part OS in the cloud, Remote Software, Remote Applications. The user device would simply have to log into the cloud and choose the end service and the enablers will dynamically support the end service. Thus a lot of storage on the device (such as mobile phones), will shift to the cloud which will come into service only when required by the user. The high data speeds will support the dynamic transfer of data and services through the air. Google is mixing up some music and serving it from the cloud and massifying it through social networking features to create its long anticipated music service. The Music service would thus include an a la carte digital download store, a subscription cloud locker ($25 to the consumer per year) through which listeners would stream or download their music. Google is also working on providing each customer the ability to listen to a full track song for the first time after which subsequent samplings of the same song will be 30 second bits. This is reminiscent of the Lalal.com music service. The cloud locker would also enable social networking features, such as allowing users to send playlists to friends in their networks and also enabling the friends to sample the songs once in its entirety. Google would make available a web-based music player and a mobile application for playback of tracks from the cloud-based locker. Google is seeking an initial three-year licensing agreement from the labels for each territory it launches its music service. The details of the launches have come to the fore yet.There are questions that remain unresolved, such as how much storage capacity the locker would provide and whether the labels would grant Google the ability to provide a free full-track stream for the duration of the initial three-year agreement and exactly how labels and publishers would be compensated for their music. Google’s cloud-based locker would scan a subscriber’s hard drive for music files. Any tracks that Google recognizes as music that it has licensed would be listed by Google as being accessible to the user from their cloud-based account. Such tracks could include those purchased at the Google download store or another download retailer, tracks ripped from a CD and even music files downloaded from peer-to-peer networks. Inclusion of P2P tracks may get some pushback from label executives. However, in order for this concept to work, Google will need to allow P2P tracks to populate lockers. On the contrary, the labels would probably press Google to take stronger measures to fight music piracy, such as excluding P2P sites from search results or blocking the use of apps for Google’s Android mobile operating system that facilitate P2P access. 2.It had lost 67% of its Market Cap after the introduction of Androids and iPhone, in the last three years.Nokia market value has shrunk by 60 billion euros in these three years. 3.It had recently seen a change in the top as OPK (Olli Pekka Kallusvuo) stepped down and Elop stepped in. OPK’s exit wasn’t on the best note given Point 1 and 2 earlier. 5. 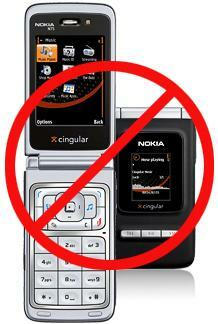 Ovi hasnt set things up for Nokia the way they would have liked it to. 6. Nokia has also been struggling to maintain its ASP. The ASP drop is around 20%. What really comes as a surprise however, is Nokia’s enthusiasm is based on 12MP device with Xenon Flash! The N8 is the panacea, or so Nokia would like to believe. There were no Meego announcements made(and this was hyper anticipated). 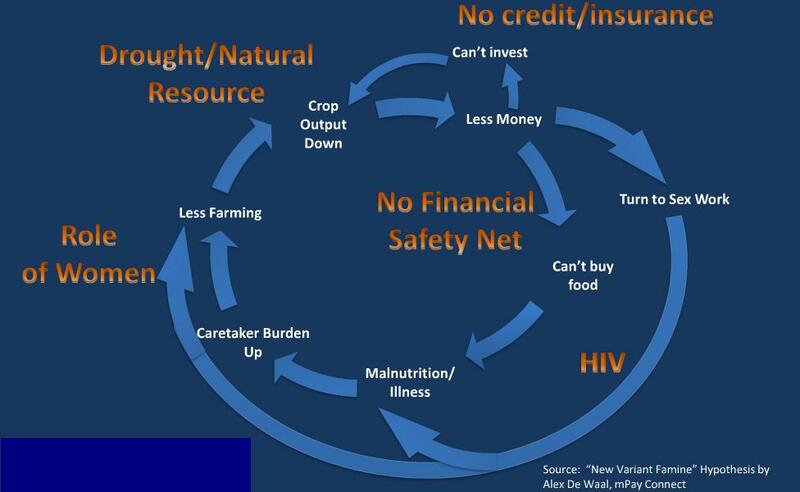 Is the problem at Nokia a myopia in identifying the real problem. Where is the software focus? Nokia’s problemis that it’s fundamentally a hardware company. In the early days of the mobile phone industry, that was a good thing to be, because then it was all about handsets, and Nokia was very good at designing and making them. It was also astute in spotting the strategic importance of the GSM standard, and pushing hard for its adoption – which is what enabled Europe to leapfrog the fragmented US mobile phone market. So for a long time, Nokia flourished – as a hardware manufacturer. Of course its phones had software, but in those days it was very much a secondary concern because it wasn’t expected to do very much. But there came a moment in the evolution of the mobile phone when suddenly the software was more important than the hardware. 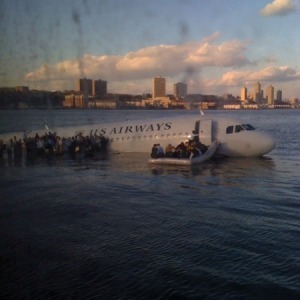 That moment was the arrival of the iPhone. And Nokia missed its significance for two reasons: its senior people – being hardware-focused – didn’t see it; and the company lacked the software capability to compete. It didn’t, for example, have a mobile operating system that was up to the job. In fact, it still doesn’t, which is why it will eventually be forced to buy one in from outside. The only available options are Windows Phone 7 and Google’s Android. So, in the end, it looks as though Nokia’s future will be as an OEM (original equipment manufacturer) of handsets running someone else’s operating system. Nokia World: If betting on recovery purely basis hardware be the signs, Nokia is not out of the woods yet. Nokia will need more than a structural change in thought with regards to software and user experience. It will need a more fundamental change in the way they see the horse (software) and the cart (hardware).Currently the focus is quite the opposite. Google and Apple have increasingly faced off in consumer electronics and software programs of all stripes. 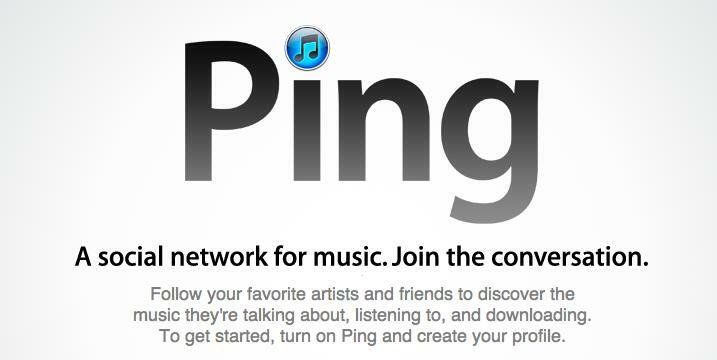 For one thing, there was the surprise revelation of Apple’s Ping last week, a social network all about music that’s integrated with the latest version of iTunes. Google’s plans for a social network of its own are still unclear, though rumors of a “Google Me” service have been around for some months. There are reports by Reuters that Google is in talks with music labels for a music download store and a digital song locker — space that Apple clearly has a vested interest in.Google has acknowledged that the company did have plans to expand into music but again, the details are not clear. The only missing piece of the television puzzle is the stuff consumers are most interested in — mainstream content. During the unveiling of the new Apple TV, Steve Jobs said consumers would be able to rent first-run movies for $4.99 or high-definition TV shows for just $0.99, initially just from ABC and Fox.”We think the rest of the studios will see the light and get on board with us pretty soon,” Jobs said. Google has yet to announce content partners, stressing instead the world of free online videos. Schmidt also said Google would announce partnerships later this year with makers of tablet computers that would use Google’s new Chrome operating system, due to be launched soon, rather than its Android phone software that has been used for mobile devices until now.Google plans to make its Chrome browser, which competes with Microsoft’s Internet Explorer and Mozilla’s Firefox, the center of an operating system that would offer an alternative to Microsoft Windows.